Almost 70 percent of government IT decision-makers agree that end users are aware of agency security policies, yet lack of training is considered an obstacle to preventing cyber threats by about one-third of survey respondents. “Cyber security awareness training can help solve many of the challenges we face with protecting information technology assets, and our government’s most sensitive information and mission-critical systems,” said Deon Viergutz, president of Ft. Meade Alliance and director of cyber operations for Lockheed Martin Information Systems & Global Solutions. The poll measured awareness and attitudes about a wide range of cyber security topics, including threats, challenges to insider threat prevention and investment priorities for prevention of insider threats. Survey results reflect respondents from federal civilian and defense/military agencies. Fill out the form below to download the infographics. 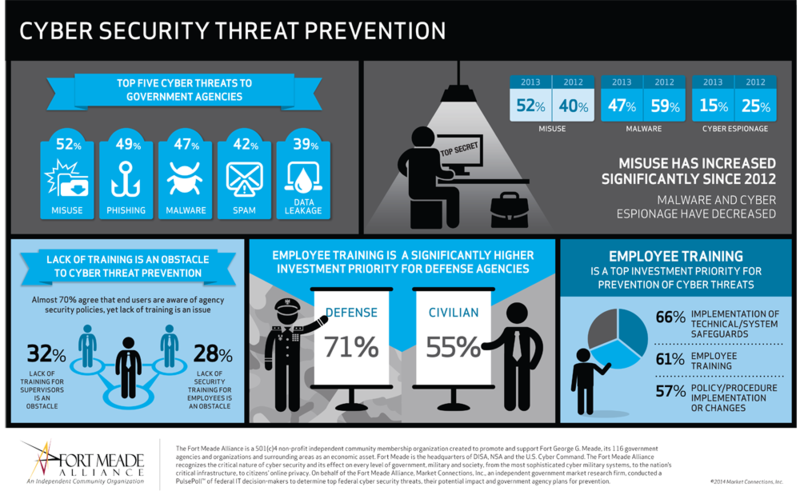 How do defense agencies prioritize employee training versus civilian agencies?